Culture Collide Festival, the brainchild of Alan Miller (co-founder of FILTER Magazine), returns for its sixth year of international music discovery. The festival partners with record labels like 100% Silk, Stones Throw, Sargent House, IHeartComix, and more to introduce over 40 fresh faces and nationally renowned acts to connoisseurs of the West Coast, spanning three days in several venues dotted across Echo Park: TAIX, The Champagne Room, The Echo/Echoplex, Echo Park's United Methodist Church, and Lot 1 Café. Bands travel from their homes in Canada, Australia, New Zealand, Israel, Korea, France, Ecuador, Peru, and more to perform in the musical melting pot of Los Angeles. This year, Culture Collide has also teamed up with the Modern Sky record label to feature a special Chinese Indie Night at the Regent Theatre (10/9) with acoustic folk performer Song Dongye (宋冬野), synthpunk New Pants, and Miserable Faith (痛苦的信仰乐队). Purchase tickets or learn more about the bands here. Nick Diamonds: The Canadian musician has fronted dozesn of bands including the notable Islands, collab'd with notables like Alpha Pup's Daddy Kev and Honus Honus (Man Man), even helping to pioneer a genre of music called Doom-wop. Now situated in Los Angeles, Nicholas Thornton reveals the great follow-up to his 2011 debut: the bedroom bummer, electro-noir full-length City Of Quartz. Cruising back from his recent tour through SF and Santa Cruz, Nick Diamonds will perform at the Echoplex on 10/9. Check out the single to City Of Quartz, "The Sting", below. The Album Leaf: The solo project of Tristeza's original member James LaValle is among the most respected in post-rock circles, invigorated with glitch and ambient spirits that diverged from his guitar-centric peers. Since the release of A Chorus of Storytellers in 2010, LaValle has spent the last two years working on a new album, and he's bound to play some unreleased tracks at Culture Collide. 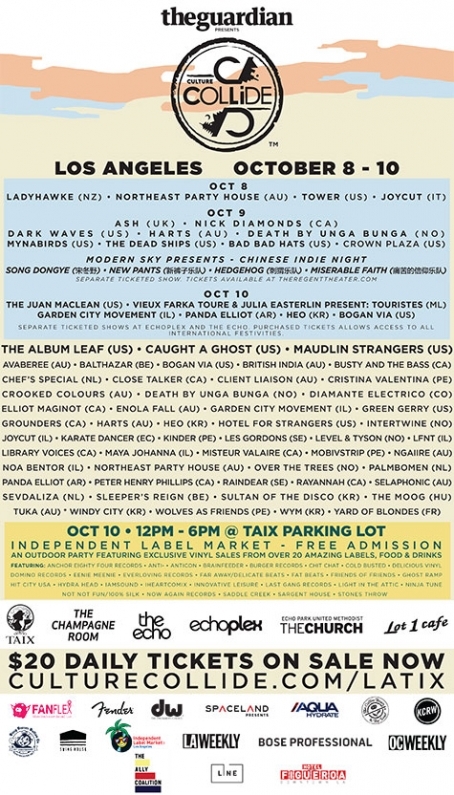 The Album Leaf plays at The Church on Friday 10/9. Heads up: a video for his newest single "New Soul" drops the same day. Listen to his last single featuring folk solo artist Peter Broderick, titled "Never Held a Baby". The Grounders: Toronto's psych-y krautrockers celebrate the release of their self-titled debut LP, a sonic poptart with lo-fi noise crust enveloping a gooey synth filling. Following their 2013 EP "Wreck of a Smile", bandmates Andrew Davis, Daniel Busheikin, Mike Searle, and Evan Lewis got together to explore Zombies and David Bowie with a self-help guide by David Lynch and Meditation for Dummies. The result: a blissful and cogent series of recordings laid out in Davis' Toronto bedroom and a studio-converted garage stacked with vintage equipment. Listen to the single "Bloor Street And Pressure" and watch them twice at Culture Collide: 10/8 at Lot 1 Café and 10/9 at TAIX. The Vim Dicta: Channeling glorious garage-y psychgroove from the LA basin, The Vim Dicta's Cori Elliot, Matt Tunney, and Chris Infusino were regarded by The Deli's staff as one of the Best New LA Bands in 2012 with their live-recorded debut EP "Lucky Strike". The 2013 follow-up "Von Tango", a five-song collection of guitar scuzz, jazz growl, and noir grit, furthered the notion that Los Angeles hadn't seen the last of devilishly soulful music — rock certainly is not dead, at least not for The Vim Dicta. With a new album in the works, the trio are currently performing a free spread-out residency at Harvard & Stone (next show on 10/21). The Vim Dicta plays Saturday 10/10 at TAIX. Listen to "Stallion" off the "Von Tango" EP below. The Mynabirds: A previous Deli feature, The Mynabirds' Laura Burhenn fronts a blend a garage rock, pop, R&B, and soul that has turned the heads of every tastemaker across the coasts. We waxed poetic about her summer release Lovers Know, which was featured on NPR and reviewed positively by Drowned in Sound and The Line of Best Fit — need we say more? The Mynabirds wrap up their US tour for Lovers Know at The Echo on 10/9, and if you haven't seen them perform yet, you can thank us later. WYM: The solo project of modular synth artist Jun Hyung Byun, alias bjorn (뵤른) and one half of Seoul Disco's electronic duo MDS, makes his LA debut at Culture Collide. WYM's aesthetic is derived from careful manipulation of '80s patches to create prismatic soundscapes that combine dreampop, chillwave, ambient, electronica, and synthpop like his peers YUKARI, Clazziquai, and House Rulez. This isn't the K-pop that's been taking over the states by storm; it's a taste of Korea's electronic underground that your ears have been deprived of for years. Better late than never.